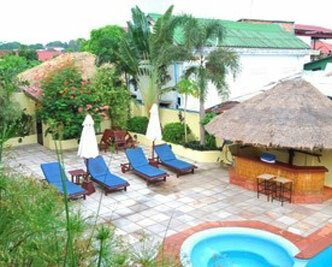 REEF RESORT is ideally situated between the famous Golden Lions roundabout and Serendipity beach in an area which is fast becoming the center of entertainment, dining and accommodation in Sihanoukville. The resort is Western designed and managed offering the best value quality rooms within the mid market price range. With only fourteen rooms, REEF RESORT has an exclusive, boutique feel and the tucked away private swimming pool is never too busy.The REEF RESORT is now pleased to also offer both family rooms and a family apartment. Check the rates page for details.